Two weeks before Christmas in 1965, a pair of Gemini spacecraft—sleek little black-and-white capsules, which John Young once dubbed “Gusmobiles”—serenely circled the Earth together and in close proximity. Aboard Gemini VII, astronauts Frank Borman and Jim Lovell were midway through a record-breaking 14-day mission to spend the equivalent of a long-duration lunar voyage in Earth orbit, whilst aboard Gemini VI-A fellow astronauts Wally Schirra and Tom Stafford had taken the lead in executing the world’s first rendezvous between a pair of piloted vehicles in space. It was a critical step toward achieving the late President Kennedy’s goal of human bootprints on the Moon before 1970. Although the Soviet Union had managed to bring two spacecraft close together during the Vostok era, they had not performed true rendezvous. 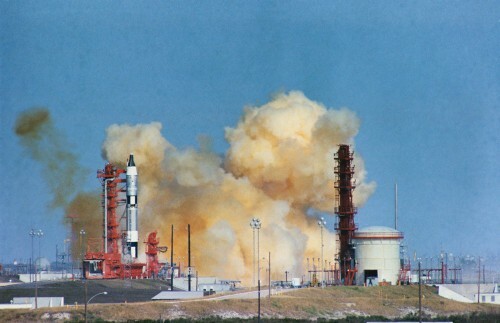 Yet the Gemini success came at the end of two disappointing months which saw a rocket explode, a pair of manned missions combined into one, a vice president fall asleep in the simulator … and a hairy on-the-pad launch abort which could easily have spelled death for Schirra and Stafford. Flying for longer periods in space, according to flight surgeon Chuck Berry, had “qualified man to go to the Moon.” In August 1965, astronauts Gordo Cooper and Pete Conrad returned in good physical shape after eight days in orbit. Next up, in late October, Schirra and Stafford would spend just two days aloft, but would actively bring their Gemini VI craft close to a Lockheed-built Agena-D target vehicle, launched atop an Atlas booster. The importance of the flight was such that both the prime crew and their backups, Gus Grissom and John Young, were highly experienced. Although it would be Tom Stafford’s first mission, he was already recognized as an expert in space rendezvous. Having said this, Grissom wanted command of the first Apollo mission and pursued it relentlessly. In his autobiography, We Have Capture, Stafford noted that although Young sat through simulations with them, Grissom was often absent, racing cars or boats. Following Gemini VI would come the 14-day Gemini VII, sometime early in 1966, with Borman and Lovell. Although the so-called Gemini-Agena Target Vehicle (GATV) was a fundamental aid in demonstrating rendezvous, docking, and performing linked exercises in space, doubts about its reliability were prevalent within NASA. Some managers felt that it could not be trusted to execute maneuvers with a docked Gemini, although Wally Schirra lobbied for it to fly. He also wanted a firing of the Agena’s less powerful secondary propulsion system, although this was not initially incorporated into the Gemini VI flight plan. Gemini VII, bearing astronauts Frank Borman and Jim Lovell on a record-breaking 14-day mission, is seen through the windows of Gemini VI-A, with fellow spacefarers Wally Schirra and Tom Stafford. 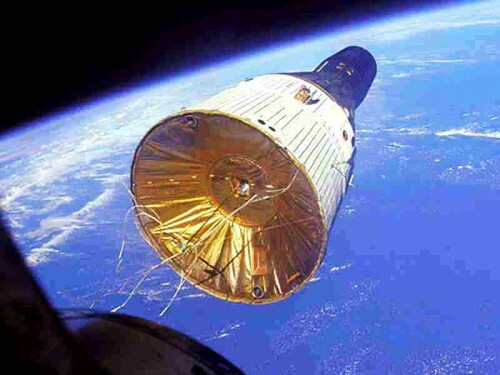 This mission, in December 1965, marked the first ‘true’ rendezvous between two piloted vehicles in orbit (Credits: NASA). First up would be the Agena, mounted atop its Atlas rocket, from Cape Canaveral’s Pad 14, boosted into a 200-mile (320-km) circular orbit. One hundred minutes later, Schirra and Stafford would follow aboard Gemini VI from Pad 19, their Titan II injecting them into a lower orbit. “Two hundred and seventy degrees behind the Agena,” wrote Stafford, “you’d make a series of maneuvers that would eventually raise the orbit of the Gemini to a circular one below the Agena. Then you’d glide up below the Agena on the fourth revolution. At that time the crew would make a series of maneuvers to an intercept trajectory, then break to station-keeping and docking.” This docking would occur over the Indian Ocean—some six hours into the mission—and after which Schirra and Stafford would remain linked for seven hours and return to Earth following their battery-restricted two-day flight. The astronauts wanted to relight the Agena’s engine whilst docked, but NASA managers vetoed it as too ambitious. Early on 25 October, out at Pad 14, a team from General Dynamics oversaw the final hours of the Atlas-Agena countdown. The Atlas booster, tipped with the thin, pencil-like Agena, was scheduled to fly at precisely 10:00 a.m. EST. Meanwhile, Schirra—who was struggling to give up smoking—lit up a Marlboro during the ride to Pad 19. He felt, wrote Stafford, that “he could survive a twenty-four-hour flight without getting the shakes.” At length, General Dynamics launch manager Thomas O’Malley pressed the firing button for the Atlas-Agena at 10:00 a.m., and the first half of the mission got underway. 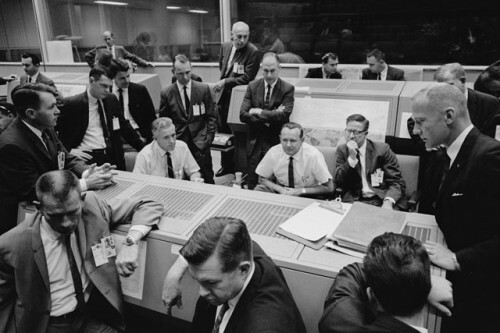 Flight controllers—with Flight Director Chris Kraft seated at center—watch their monitors in dismay after the loss of the Agena on 25 October 1965. The incident led to the development of a new plan to fly a rendezvous mission between two manned craft, Gemini VI-A and Gemini VII (Credits: NASA). Almost immediately after the Atlas-Agena lifted off, things started to go catastrophically wrong. It would appear that the Agena separated properly from its carrier rocket, but seemed to “wobble” a little, despite the efforts of its attitude-control mechanism to steady it. Right on time, its engine flared to life … and nothing more was heard. It had reached an altitude of about 150 miles (240 km) and was 500 miles (800 km) downrange of the Cape. Fourteen minutes after liftoff, specialists at the Bermuda radar station expected to receive tracking. They saw nothing, save the signatures of five large fragments. Out at Pad 19, Schirra and Stafford were listening to the updates and were puzzled. “Maybe it’s the tracking station,” Schirra speculated. “Let’s wait for Ascension Island.” Their countdown was held, but at length Ascension, too, saw nothing. Later, the Carnarvon station in Australia saw nothing, and the assumption had to be made that the target vehicle had been lost. Subsequent investigation revealed that the Agena had exploded, due to a pre-launch change in the oxidizer feed sequence protocol. If it represented a programmatic failure with the vehicle, the issue spelled trouble for Project Gemini, which depended upon the Agena as its primary rendezvous target. In the meantime, a disappointed Schirra and Stafford were extracted from Gemini VI and headed off into town with Chief Astronaut Al Shepard and backup crewman John Young. Others thought it could be done. Joseph Verlander and Jack Albert proposed stacking a Titan II and placing it into storage until another had been assembled. The Titan’s engine contractor, Aerojet-General, had stipulated that the vehicle must remain upright, but this could be achieved and the rocket kept on the Cape’s disused Pad 20. Immediately after the first Gemini’s launch from Pad 19, the second Titan could be moved into position and sent aloft within a week. The plan, however, held little appeal and received little enthusiasm, with most attention focused on swapping the lighter Gemini VI for the heavier Gemini VII, thereby making good of a bad situation by using the Titan II already on the pad to fly Borman and Lovell’s 14-day mission. As these plans crystallized, Burke and Yardley posed their joint-flight idea to senior NASA officials, who found few technical obstacles, with the exception that the Gemini tracking network might struggle to handle two missions simultaneously. At first, Flight Director Chris Kraft thought they were out of their minds, but after consulting his control team and Deke Slayton, the head of Flight Crew Operations, relented. The prospects for Burke and Yardley’s plan steadily brightened when it became clear that the heavy Gemini VII—which, after all, was intended to support a mission seven times longer than Gemini VI—could not be lofted into orbit by Schirra and Stafford’s Titan: the booster lacked the necessary impulse. Yet the question of tracking two vehicles at the same time remained. Then, another possibility was aired. Could the tracking network handle the joint mission if Gemini VII were regarded as a “passive” target for Gemini VI? Borman and Lovell would launch first and control of their flight would proceed normally as Gemini VI was prepared to fly. As soon as controllers were sure that Gemini VII was operating satisfactorily, they would turn their attention to launching Gemini VI; in the meantime, Borman and Lovell’s flight would be treated like a Mercury mission, wrote Deke Slayton, “where the telemetry came to Mission Control by teletype, letting the active rendezvous craft have the real-time channels that were available.” This mode would continue until “Gemini VI-A”—renamed to distinguish it from the original Agena-based mission—had completed its tasks and returned to Earth. After Schirra and Stafford’s splashdown, Borman and Lovell would again become the focus of the tracking network. Since their assignment to Gemini VII, Borman and Lovell had been intensely focused on their primary objective: to spend 14 days (330 hours) in space, thereby demonstrating that astronauts could physically and psychologically withstand a maximum-length trip to the Moon and back. The results from the two previous long-duration flights, Gemini IV and Gemini V, had been mixed. Jim McDivitt and Ed White had returned fatigued after four days, while Gordo Cooper and Pete Conrad had hardly enjoyed their eight days sitting in an area the size of the front seat of a Volkswagen Beetle. Sleeping in shifts of four or five hours apiece had proven impractical, Borman and Lovell learned, so they resolved to sleep and work together. Moreover, they felt that their “work” time would not benefit from a rigid plan, opting instead for a broader outline which they could adapt in orbit. 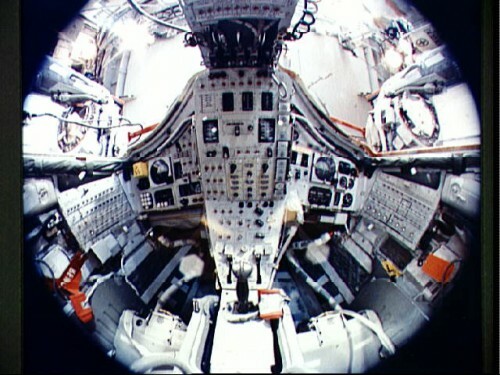 This fish-eye view of the interior of Gemini VII reveals the limited space available to Frank Borman and Jim Lovell during their 14-day mission. Within this cramped volume were not only the men themselves, but their food, experiments, cameras … and bags for their bodily wastes. Both astronauts likened it to living for two weeks in a men’s room (Credits: NASA). At 2:30 p.m. EST on 4 December 1965, Gemini VII roared into orbit. “We’re on our way, Frank!” yelled Lovell as the Titan rolled and pitched in its ascent trajectory, achieving orbit five and a half minutes later. After a station-keeping exercise with the Titan, they settled down to eight days of experiments, ahead of the launch of Gemini VI-A and the rendezvous. As the flight wore on, conditions became increasingly less comfortable, with both men complaining of stuffy noses and burning eyes. The cabin, Borman reported, was too warm. Removing their suits helped, yet even that had been a matter of some debate on the ground. Days earlier, on 29 November, Bob Gilruth had requested approval from NASA Headquarters for the astronauts to remove their suits after the second sleep period and only don them at critical junctures, such as rendezvous and re-entry. By the time Gemini VII launched, the plan had been amended slightly: one of them had to be suited at all times, but the other could remove his garment for up to 24 hours. Both men, however, had to be fully-suited for rendezvous and re-entry. Still, the intense discomfort was there and, as the mission wore on with no major issues, the rationale behind the one-suit-on/one-suit-off decision became unsupportable. Clouds of smoke hang ominously around Pad 19 as Gemini VI’s Titan sits motionless in the seconds after the abort. Note the absence of an escape tower atop the Titan; in an emergency, Schirra and Stafford would have used ejection seats. Many astronauts doubted the reliability and survivability of the seats, which factored into Schirra’s decision not to use them that day (Credits: NASA). Kenneth Hecht, head of the Gemini escape and recovery office, was surprised that he did not eject, but in reality, neither Schirra nor Stafford had much confidence in the seats and instinctively desired to remain with their “bird” as long as possible. Stafford felt that the 20-G acceleration of an ejection would have left him with, at best, a cricked neck for months. Moreover, there was a very real risk of death.